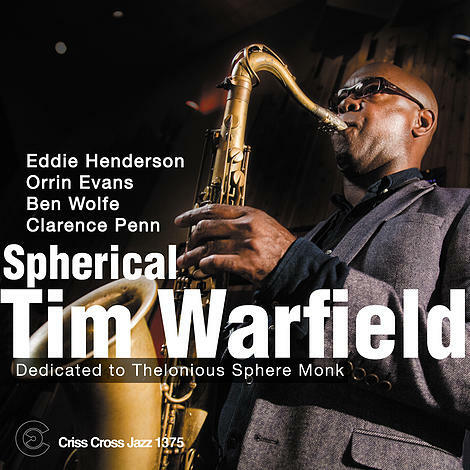 Tim Warfield's eighth Criss Cross leader recording Spherical, which references the middle name of its primary subject, immortal jazz pianist-composer Thelonious Sphere Monk, is the tenor/soprano saxophonist's most idiosyncratic and personal document to date. To be specific, Warfield and an efflorescent quintet of virtuoso teamplayers (Eddie Henderson, trumpet; Orrin Evans, piano; Ben Wolfe, bass; Clarence Penn, drums) personalize six Monk compositions ( Off Minor , Ugly Beauty , Oska T , Gallop's Gallop , Coming on the Hudson , and Round Midnight ) and That Old Man (which Monk recorded as "Children's Song" in 1964), as well as an original Warfield blues dedicated to Monk's first employer, Coleman Hawkins. All members improvise with a creative force that shows the depth of their engagement with the essence of these masterworks; the will to swing defines the proceedings throughout.